When I pictured kayaking again after a 30 year hiatus, I envisioned a calm, crystal clear lake, not the flowing, murky-brown depths of the tidal Brisbane River. So when my brother called me up a few days ago for a spontaneous kayaking adventure beginning at Colleges Crossing, I had a few reservations. Drowning isn’t usually a consideration while hiking and even though toileting in bushland may be awkward sometimes, relieving oneself while kayaking on the river is a little more complicated. There was also the problem that everything could get wet, including my beloved, can’t-go-anywhere-without-it, Canon camera. Sitting on a hard plastic seat for a day also seemed like a good recipe for a stiff back and the world’s worst case of haemorrhoids. I’ve sometimes seen interesting things like large logs, drums and washing machines floating on the Brisbane River and the dim memory of reading tales of an enormous rogue crocodile may have slightly added to my concerns. Sometimes I wish I didn’t have quite so much imagination. A day out with my only sibling is a rare event though and while sometimes a little risky, they are always fun-filled and memorable. You can read about one hiking trip I’ve done with him in Karawatha Forest – A Refuge From the City. The water at Colleges Crossing Recreation Reserve appeared reassuringly calm as we unpacked all our gear. It was then I discovered my brother’s kayaks are not the flimsy, unstable, hard- seated variety. They’re fishing kayaks – shorter, wider, heavier, with comfortable padded seats and plenty of room for gear – more like the cruise ship variety really. Despite this, I opted to take my cheap bike camera instead of my new Canon in case of accidents so unfortunately you won’t be seeing close-ups of birds or rogue crocodiles in this post. If you want to see beautiful pictures of birds and other scenery on Australian kayaking adventures please check out the blog of berowabackyard.wordpress.com . Her latest post has beautiful shots of a peregrine falcon eating dinner. I managed to get in without capsizing the thing but if my brother wasn’t holding it steady, it may have been a very different scenario. Off we paddled, intrepid river explorers, ready for anything. I breathed in the invigorating, slightly rotten smell of the Brisbane River, soaked up the heat of a clear blue Brisbane sky and felt amazingly alive. Gliding along the river reminded me of cycling but without traffic lights, hills and crazy car drivers. That’s me in the blue kayak. Within 10 minutes, gliding turned into mad thrashing. After rounding a bend, the waterway had narrowed, increasing the speed of the current which was already quite strong from the incoming tide. With a strong wind on our backs we were flying along. This would have been very exciting except that a multiple arched, low concrete bridge just ahead promised to decapitate us. We’d started our paddle a little too late in the morning and the gaps were too narrow to safely negotiate. Eventually, I made some ground by going diagonally towards the inner bank of the bend where the current was a little slower. Now of course there is no photographic evidence of our little drama so I invited an anonymous artist to depict the scene from above. It was a heart-pounding way to restart my long dormant, very short kayaking career. I was never in any real danger though as the kayaks are so solid I could have banged them against the bridge and scrambled over the top…probably. Another great sibling memory to add to the collection. I also managed to thoroughly soak my backpack with all that water thrashing. Thank goodness for ziplock freezer bags otherwise I’d be eating brown soggy bacteria-ridden sandwiches. Oh, did I forget to tell you that the water quality of the Brisbane River is quite poor? Within a few minutes of entering the water weeds, the kayak was invaded by 100s of tiny crickets and a few small spiders. Even on the river I can’t escape them! It was peaceful on my little island in the river and if my brother hadn’t returned I may have fallen asleep. LB battled the current of the rising tide to return and was in need of my island for a breather. Here he threw out a few lines while I enjoyed the tickling sensation of crickets and pondered the universe. Just before the tide turned we headed along the section he’d explored. LB threw out his line again while I looked for birds. We eventually made it out into a wider section of the river where I saw an Australasian darter. I wished I’d had my Canon for a better shot. The old $90 Olympus with a shattered battery case held together by sticky tape just wouldn’t do the job properly. When the tide turned and the water was lower and calmer we returned via the bridge which had terrified me only a couple of hours before. It was a good reminder of how changeable paddling conditions can be on a tidal river. Doesn’t this look idyllic? Even so, there was a submerged branch/log across the archways and only one narrow path that was safe for the kayaks to take so we had to paddle carefully underneath and lean back slightly. Here is LB after having gone through. The picture makes the gap look deceptively big. I don’t hate sharks; I have a healthy respect for them. I just never expected them to be this far up the waterway! Upon researching bull sharks I found out they are unusual in that they can cope well with freshwater. Unlike many sharks, they are territorial and may be aggressive. They are listed as being a species more likely to be involved in attacks on humans. I was surprised to read that bull sharks have been populating the Brisbane River since before the British arrived. The female sharks give birth to pups in the rivermouth and estuaries and the pups then swim upstream and live in the river for a few years until they are big enough to enter the ocean. While sharks below 1.5 metres are not likely to attack humans during the day and there are no recorded deaths in the Brisbane River in recent years, family pets have been taken and recently a thoroughbred horse being trained in the water was attacked. Although there are supposed to be signs warning people of bull sharks at colleges crossing, I didn’t see them. As with all wild creatures, if we are sensible and respect the shark living in its own environment, attacks are rare. The sharks have only been sighted as far as Colleges Crossing and not past the weir. Dawn, dusk and night are definitely times to avoid being in the water when the sharks are more likely to be feeding and not scared by boats and other noisy daytime activities. It’s still not recommended you swim there during the day though. For information and a video about bull sharks please check the Australian museum site here. After the day, what was my evaluation of kayaking on the river? Some of my fears were unfounded while some weren’t. Tidal rivers vary in conditions and they are more dangerous than a still lake. I expect they are more exciting though. As we found out, you never know what’s around the next bend! I would recommend always wearing a lifejacket but perhaps I am biased as I’ve never been a strong swimmer. It was disappointing not to have a good camera with me, so if anyone wants to recommend some options or a company wants to give me a waterproof GoPro or camera to review, I won’t say no! I found these fishing kayaks, priced at around $500AU, very comfortable and I’d recommend them to people with dodgy joints like me. Gliding along in calm waters is extremely meditative. It did remind me of cycling in that respect. There is a sensation of flying. It’s also much cooler above the river than hiking in open country. I sweated far less than usual, meaning I needed to carry less water for the whole day. Finally, I’m grateful to my adventure-seeking brother for introducing me to river kayaking. I’m now at terrible risk of being thoroughly addicted to it. For more information about the many facilities available at Colleges Crossing Recreation Reserve please check this site. Next week will be the promised trip report about Wivanhoe Hill trails and heatstroke. You are so brave to go on such an adventure though the kayaks sound OK to be paddling in. I should think that the time in calm water must have been really pleasant, I hope you go again but no sharks! 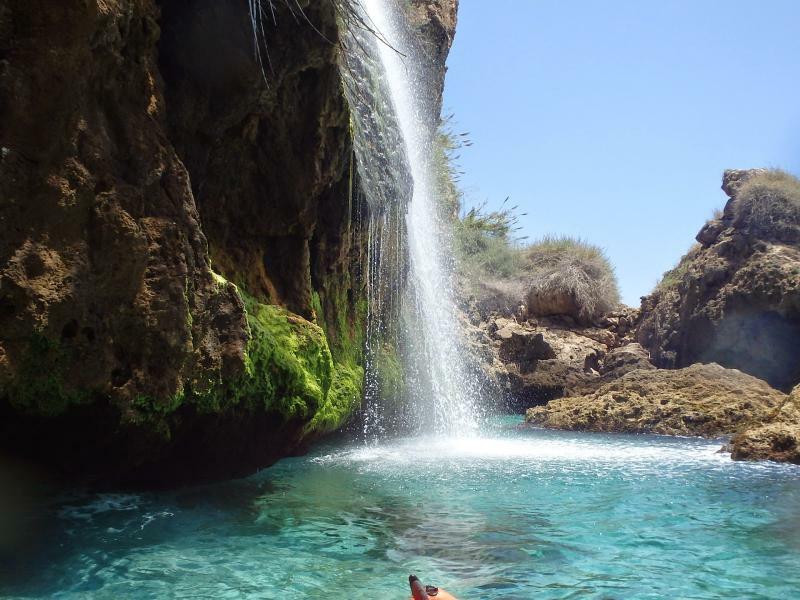 One of the most popular places in Málaga for kayaking is Maro-Cerro Gordo Cliffs Natural Area, with wonderful cascade. Fortunely, the sharks don’t know it. Yes. I good kayak makes all the difference! We’d been renting crappy ones for years before we bought ours. Mine is a sports model, hubby’s is a fish one. They are a bit bigger than the ones your bro has. I needed stability!! Brother’s are good for that.. not giving you ALL the details (ie sharks!) Yes, ours are 10.5 feet. I sit in mine a bit deeper also. I think if you type new kayak into my search, it will come up with a post to see our new ones. There are also ocean types at 12 feet. I just didn’t want to lug around that much kayak. Many times you need to carry it a bit from truck to water. Your post couldn’t have been more timely for me. We have been kayak-less since we left Alaska, but just bought a new one for use here in Maine. I cannot wait to get back on the water. And our new kayaks have fancy, comfortable seats too. Such an upgrade. We don’t have to worry about being bumped by sharks here. No ticks on the water is another upside! I hope that bridge isn’t looming in your nightmares. It’s the kind of thing that imbeds itself in the horror part of the brain, only to reemerge in the dead of night. It’s a good thing I’m a trusting soul, or I might think your shark story is a lot of bull – ha ha ha. I survived an encounter with a loan shark once, but my wallet wasn’t as fortunate. We always know from the beginning that you survived the adventure because otherwise we wouldn’t be reading your latest post—unless it was written as a post mortem by someone masquerading as you, but that would be hard for someone to do because of your distinctive style. In contrast, we’re always amused by your tongue-in-cheek language. Hi Steve. If I ever do die while on a trip, my long suffering daughter has been given instructions to write the post for me. I like to plan ahead sometimes you see. One song I will have her include is the version of “Smile” sung in the movie My Girl II. By coincidence, in the film the daughter is watching a film of her own dead mother singing it. Thank you for the link to the flower. I have a vague recollection that you may have helped me out with that one in a past post. Since I am not sure, I obviously need reminding! 🙂 Old age. Your pics of them are far superior to my own, Steve. Interesting that the botanist didn’t like it named after him. It’s such a pretty flower. Better than being named after a stinky type of grotesque looking fungus…although perhaps that would be far more interesting? I didn’t remember it either. I’m not familiar with the movie My Girl 2 but I found an online version of the scene with the song. Did you know that Charlie Chaplin wrote that song? Yes I did, but I remember being surprised when I first found that out some years ago. It is interesting that although the song tells people to “Smile, what’s the use of crying?” it usually brings tears to my eyes watching that particular version. Jane, you went kayaking on a river with friggin’ SHARKS in it? Is there anything, in Australia, that it’s not designed to eat, poison or in general harm humans? I’m half expecting one of the crickets to be the famous Super Poisonous Australian Cricket of Doom! Apart from big-toothed fishes lurking in a river, it really looks like a nice place but… I wouldn’t get in that water without a hovercraft. Or a steel boat. That looks like great fun Jane. What a brilliant way to get in and amongst the wild life too. Another fabulous post. Thanks again for sharing. Wow, what a great adventure—bull sharks and all! Yep, sibling adventures can be a blast. Hi Jane this was a really adventer. Before i had a car-accident I go kayaking every week.I had buy a kayak.I Now I go only walking Thanks for sharing your story and photos.It’s magnificent. Yes, I seem to be getting better finally, with just a slight cough left. I’m guessing that might even be springtime allergies. It’ll be interesting to see if our desert adventure alleviates that. We’re headed out for a fun trip early tomorrow, so I won’t be blogging for a couple of weeks. This time it’ll be for a fun reason instead of ill health! Yay! Hi Jane, sounds like a great sibling adventure! Thanks for sharing. I haven’t been kayaking since I was a kid. You have renewed my desire to get back into it. I think I’ll have to borrow one to start though, I seem to remember it being a very tiring exercise! It’s a shame about not having you camera with you. When I am conducting water activities, I too usually opt out from taking my DSLR. I often take my Nikon Coolpix instead. It’s not the same as a DSLR but it does the trick for me. Loved the post Jane, particularly the hilarious comics! I hadn’t been kayaking since my teens and in reality that was probably just a basic surf ski I think – nothing like my brother’s kayaks. I was really surprised by how comfortable these were. I expected to be very sore afterwards. The next day I had a tender coccyx, but that improved by the following day. Hiring one first would be a good idea to test out what your body can do. I didn’t find it as tiring as hiking actually and it was much cooler. It depends on your own body though. Make sure you read Gunta’s comments above as she has some handy tips. The little camera I had is similar to the Coolpix. I’d like to be able to zoom in on birds so I plan to look at ways to keep my Canon dry. Cheers for the feedback 🙂 When you work out how to keep you Canon dry, I’d love for you to share, I’d like to find a way to keep my Nikon dry! What a great day out (and those luxury kayaks look superb for a day on the river). I’m not surprised your brother failed to tell you about the bull sharks – they might have scared off even the most hardy of us. PS Those images are superb – cheap camera or not. I did enjoy this post – you write so well and always make me laugh at your adventures. You saw some attractive plants and flowers on your little island. I’m glad you came to no harm and hope you manage another kayaking trip with your brother soon. Funny timing. Spent the morning fishing from a kayak myself. Great fun but no real excitement on pond. Water is still cool here from winter and an especially chilly April morning made things interesting. Wow, a great adventure! I’m never comfortable with insects, so didn’t like to look at their close-ups. 😛 But it’s fun to know that you were comfortable with hundreds of them. That must have been a special trip with your brother. It’s probably for the best that you didn’t know exactly what was under your kayak at the time. I’ve been in the water with sharks and came to no harm, but still, your kayak sat very low in the water. Interesting adventure! I love kayaking, but then we don’t have sharks or crocodiles to contend with here in Michigan, I have also learned the hard way that kayaking isn’t the most friendly hobby to combine with photography, so your decision not to bring your good camera was probably a wise one. I loved the drawings, I’ve been in those situations where “unintelligible screaming” seems to help, most people that is. I find it more productive to concentrate on where I’m headed. Great to hear about your kayaking adventure Jane and thanks for the plug for my blog – much appreciated! I completely know what you mean about unexpected problems – I had just that experience this weekend when I set out on a lake expecting “light winds” and finding white tops forming around me! Good core muscle exercise trying to rescue yourself from these situations though!! I think you did well with the sticky taped camera – that’s a distinctive snakey darter silhouette. I entirely agree that canoeing is very meditative – the comparison with riding a bike is just right. I work on simply not thinking about the sharks and hoping for the best! Hope you have many more oh water adventures! Jane, your posts make me think of Bill Bryson. https://en.wikipedia.org/wiki/Bill_Bryson They are educational and laugh-out-loud funny. Have a great week. What an adventure! You are so brave. It was a good thing that you didn’t take your nice camera. If the camera was ruined, that would’ve been very upsetting for me too. I love the drawings! Do you have a secret talent that you are not sharing? The kayak trip looks like if was a fun and wonderful adventure. I’ve done a little kayaking and don’t think that I’ve quite figured out the appropriate stroke technique when paddling because I always get really tired and seem to go slower than many other people. What a terrific bonding adventure for you and your brother. Just like a brother to leave out the sharks till after– yikes. Thanks for taking your camera along and sharing. Hi Jane, This post lives up to the Mildly Extreme theme. I loved your brother’s red and black kayaking shirt with its dramatic imagery. I noticed the title ‘Brisbane River Boys’. Are there no Brisbane River Women? NO NO NO NO NOOO I do NOT DO SHARKS!! I would have been so terrified even after the fact!!! Way to survive the adventure, and your photos are lovely no matter what camera you use! A wonderful time in a kayak! Greetings from the alps. A wonderful time in a kayak. I visit your site always from blog flowerwallpaper and sandcollection !!! The anonymous artist’s impression cracked me up 😀 This is a great post Jane! I definitely didn’t have bull shark in my mind when you hinted that something actually was there bumping the boat. Kayaking is a great way to move around and does feel a little like cruising on a bicycle without the noise and busyness of traffic. I haven’t been out in my kayak for ages but might just venture onto the creek again soon. Thanks for a great read! Thanks for the warm wishes Jane and for replying. I hope all goes well for you and your family over this time. As for a kayak trailer… I have seen a homemade one getting around the streets since my surfboard trailer was christened 🙂 but I live by the creek so it’s an easy walk down the driveway to launch so no bike towing needed. Jane, I have yet to read one of your posts without laughing hysterically, sending Forrest into the room to find out what is so darned funny! The illustrations were perfect!! I think that just added to the hilarity of “mad thrashing”. Your narration always has me on edge, and you are fantastic in spinning a story. I don’t know how you manage to come off with an even more exciting post than the last, but somehow you do. Well done, my friend! I am already faunching at the bit to hear about heatstroke at Wivanhoe Hill trails! As for sharks in the river? Lol, it seems that nowhere is safe in Australia! Sorry this reply is late. I couldn’t load my blog properly while on the road and I will be going away again soon. Those kayaks are super fun! I hope I get a chance to go again with my brother some times. Life is very hectic at the moment though. The bridge incident certainly got the adrenaline pumping! A very enjoyable read, thanks! You are an intrepid canoeist and bull-shark wrangler. Cheers, Rob. Holy crap! If I feel a bump under my kayak on a river it is probably just a carp…although they can get scary big. What a fun sibling you have! I am intrigued by the fishing kayak. Mine is a big orange plastic bathtub. Neither fast nor comfortable and my joints are getting increasingly vocal about this. On the other hand, my dream is to move to the Puget Sound area so perhaps I should hold off on kayak shopping until I see what one uses in a Sound. Sorry for the late reply. My close relative’s condition is not going to improve – she had a stroke. I’m travelling back and forth a lot and trying to arrange for 24 hr nursing care and packing/cleaning up her rental home etc. She’s only 67 so it’s pretty sad for her. I haven’t had a chance to blog or read blogs. Oh lol thanks for that one Jane! I especially love the drawings – my favourite form of communication. My first exp. kayaking was with sharks & pilot whales… scary to me. Love your adventures!